Yes, you are looking at a technical drawing of an Apple store. And yes, it does form part of an approved trademark request which means nobody can imitate Apple's temples to tech. 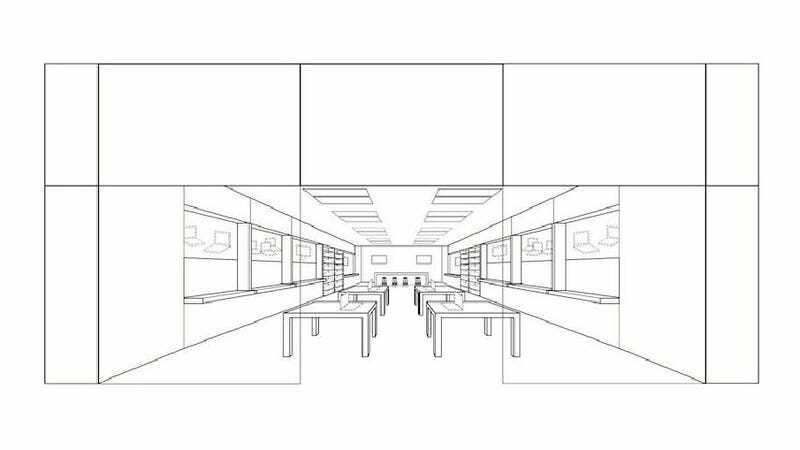 It might seem ridiculous to you that Apple has been trying to trademark a store layout—and certainly, the US Patent and Trademark Office thought so, too. In fact, it turned Apple down twice, stating that the store designs weren't "inherently distinctive". Cue Apple submitting a 122-page document outlining in minute detail exactly how they were distinctive—and a crumbling of the USPTO's defiance. The trademark covers Apple's use of—brace yourselves—paneled store-front design, glass, recessed lighting units, and... lined rectangular tables. Yes, you can trademark such things. In fact, it's not the first time Apple has protected parts of its store design: as Reuters points out, it already has a patent on its glass staircases, for instance.